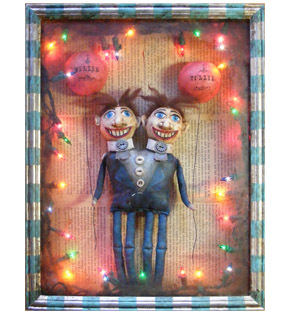 Welcome to Yesterday’s Trash, the gallery of mixed media artist Michelle Renée Bernard. Her thoughtful collection of art made from found and everyday objects will delight your visual senses. From collage, assemblage, art dolls, jewelry and more... she loves to repurpose discarded items and make them into something beautiful and meaningful. Her ecclectic array of work ranges from cute and whimsical to strange and unusual. Inspired by carnivals, vintage graphics, flea market finds, folk art and antique everything... Michelle’s art speaks volumes. Browse the galleries to see Michelle’s intriguing style... shop for Yesterday's Trash art... visit her blog for what goes on behind the scenes... or sign up for our e-mail list and be the first to know all the latest trash. ©2007 Michelle Renee Bernard. All rights reserved.